The theater previously known as Bloomington Civic opens their second season* under the name Artistry with the charming two-person play Talley's Folly. It's an ambitious season that includes interesting choices (Wit, The Baker's Wife) and big names (Christina Baldwin, Sally Wingert, and Bradley Greenwald). 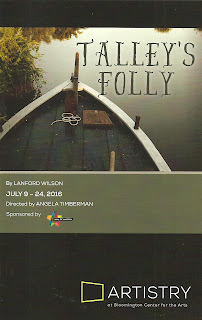 Talley's Folly is a quiet beginning to this big season, but a lovely one. 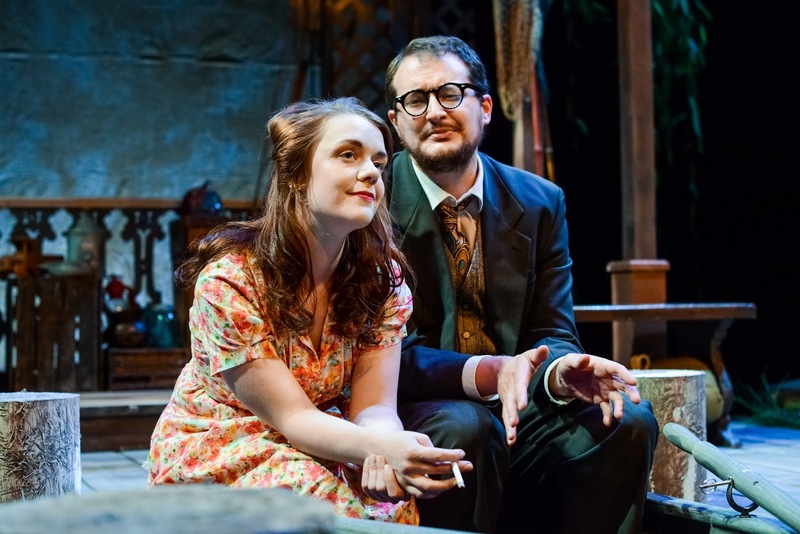 The 1980 Pulitzer Prize winner by Lanford Wilson is a sweet, funny, and poignant romance set in WWII era rural Missouri, featuring heartfelt natural performances by the cast and wonderful production design. The play begins with Matthew Friedman (David Beukema) speaking directly to the audience in the intimate space of Artistry's black box theater, setting the scene for the story that he's about to tell, which he says is like a waltz. And it is. I love two-person plays like this that are really just one long unbroken conversation between two people, played out in real time. The two people in this case being Matthew, an immigrant Jew from the big city, and Sally Talley (Chelsie Newhard), a small town girl with big dreams. Their conversation starts out a bit antagonistic. We soon learn they had a brief romance last summer and haven't seen each other in a year. Matt has come to seek out Sally and explain the long absence, and she claims to not want to talk to him, but it's obvious she's happy to see him. What follows is storytelling, reminiscing, and truth-sharing. It turns out each has a mysterious secret from their past that keeps them from getting close to anyone (like eggs afraid to break their shells). Their secrets* match up a little too perfectly to be believed, leading to a quick resolution, but it's a pleasure to watch it all unfold. Joel Sass has designed a beautifully detailed and realistic set (as he often does). We almost don't need Matt to set the scene for us in the beginning because it's all right there in front of us. The falling apart yet still beautiful boathouse with the intricate scrolls, the moon and trees, the clutter of boxes and baskets hiding secrets like gin and ice skates, even a boat that rocks. Add to that Katharine Horowitz's sound design that fills the air with country evening sounds, and we could be right there on that river in Missouri. Directed by the always hilarious Angela Timberman, who no doubt injected some of her humor into the show, both David and Chelsie are charming and natural, with an easy chemistry between them. David has always been fun to watch in supporting roles on stages around town, so it's nice to see him take the lead here. And while I've never seen Chelsie onstage before, she made a great first impression and I will be keeping my eye out for her in the future. Head out to Artistry in Bloomington before July 24 to watch this sweet little waltz of a play. *The 2016-2017 season is already upon us? It's not even Fringe time! **If you have already seen the show, or don't mind spoilers, click here for a thoughtful essay on Sally's "shameful secret" as it relates to today's world.